Be an Ultimate Survivor…live well and live longer through an active lifestyle. 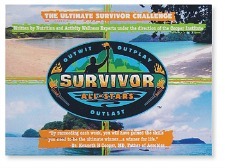 Use SURVIVOR to inspire you to get started. The Ultimate Survival Challenge is a 14-week program that teaches you the skills you need to be the ultimate winner. By practicing these skills beyond the 14-weeks and over the next months and years, you will be a winner for life.